Loved seeing the Terracotta warriors when I was in Xi’An. I’d bet they probably used a chrome-based paint to decorate the sword and the ensuring fire created that protective layer. Why does it seem so fanciful? I’m sure other chemists will have given this more thought than I have, but is it completely inconceivable that they could have stumbled over a method for this? Presumably they could have mocked up a solution of Cr3+ ions and electrode potential data predicts that such ions could oxidise Fe atoms, thereby reducing themselves to Cr atoms. Obviously you couldn’t chrome-plate a sword simply by marinating it in a solution of Cr3+ ions, but it doesn’t seem totally impossible that the process could be achieved without an electricity supply. We’d be astonished by the chromium oxide covered around the swords, and curious about how did they know the chemistry at that times. But I did believe that the technology had been developed in China about one thousand years before the western people discovered it. As with about five thousand years cultivation, China was powerful in wisdom in the ancient times. There are many tombs been not destroyed and not burned. So you can discover the influence of heating on to that hidden process. Another argument is that burning/Heating was not intended. So it cannot serve as part of common processing . My believe is that it served as metallic gray paint in order to simulate bright steel . Steel was very exensive in late bronce age and so only used for neglace or religious art. 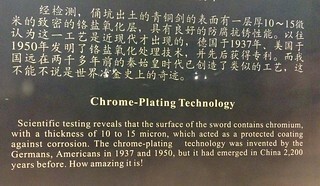 The chinese craftsmen only wanted to make the swords more precious. The Professor suggested that this could be a heat treatment; that is not requiring electricity. So it is possible it was done by the Chinese. Watching a history of the Qin and their 500 year war to dominance prior to the uniting Emperor, I noted a mention of one of the conquered tribes/areas being known for their very specially good bronze swords etc.Maybe the process was more to strengthen the surface/edge of the swords than for bling. And could have been a black Chrome process. 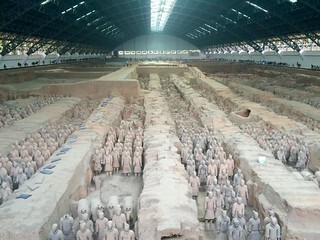 Terracotta army is the most handicraft army in the world!!! !